Bring a little coastal spirit to your decor with these ocean-inspired pieces. If you ask us—the beach is a state of mind. Even if you don't live in a coastal city or on a beautiful bluff overlooking the ocean, you can add some seaside style to your home with a few well-chosen accessories. Incorporate a bit of beach-y charm with lighting, washed-out colors, stripes, cool fresh bedding and even a few tropical elements. 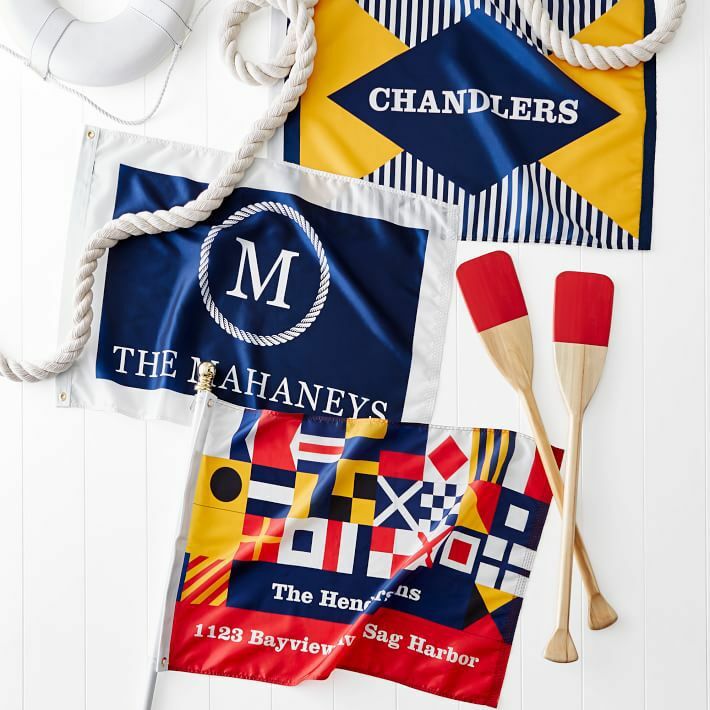 Nautical flags, cozy blankets and vibrant sun umbrellas will infuse your home with those calming vacation vibes and "so close to the ocean you can almost smell it" feelings. We rounded up some stylish home accessories, furniture finds and unexpected extras that will be almost as good as a coastal retreat. Even if they just end up in your back yard, a set of sling chairs will bring a bit of that seaside feeling to your outdoor area. These ones from Serena & Lily com in a variety of prints and colors—we're fans of a mix-and-match approach. A little on the nose? Maybe. But we happen to think that this shell bowl is actually pretty adorable. The fact that it's white keeps it from being too over-the-top, plus what's a beach house without a little kitsch? Use it when you're entertaining for hummus and veggies or that old standby, chips and salsa. Not everything in a beach house has to be completely literal. We love the way this rug—in soft, almost washed-out hues of blue, sea foam and yellow—mimics the same colors of the ocean and the beach in a modern, graphic way. Creating a feeling of coastal bliss in your home includes your bed! We love the crisp, cool feeling of Brooklinen's percale sheets, and their muted color schemes (think white, cream, navy and grey) are perfect for mixing and matching and will feel right all year long. Sun hats, sandy towels, wet swimsuits—they can all find a place to rest if you hang this expansive mirror and hook piece in your mud room. We also love that the shelf has an elegant barrier around it so you can decorate with found objects from the shore or pieces of art. If your house does happen to be by the shore, you'll want to have plenty of cozy blankets to wrap around your shoulders when you sit outside to watch the sunset or take an early morning walk on the beach. Are we being a little idealistic? Maybe. But isn't that half the fun? Beachy vibes can come from the preppy shores of the Northeast or the sun-drenched, palm tree-lined beaches of the tropics. Or both! Have a little fun with your decor inspiration and collect a few pineapple pieces, like this cute candle in a ceramic vessel. If you like your beach-y look with a serious dash of prep, you'll have a hard time resisting the broad range of linens available from Mark & Graham. We like the particularly cool and classic look of these personalized coasters which can be monogrammed. White linens and bath accessories work in just about any home, but we think that they look especially great in a beach-y abode. For a little extra whimsy, look for something with fun texture like pom-poms or tassels. 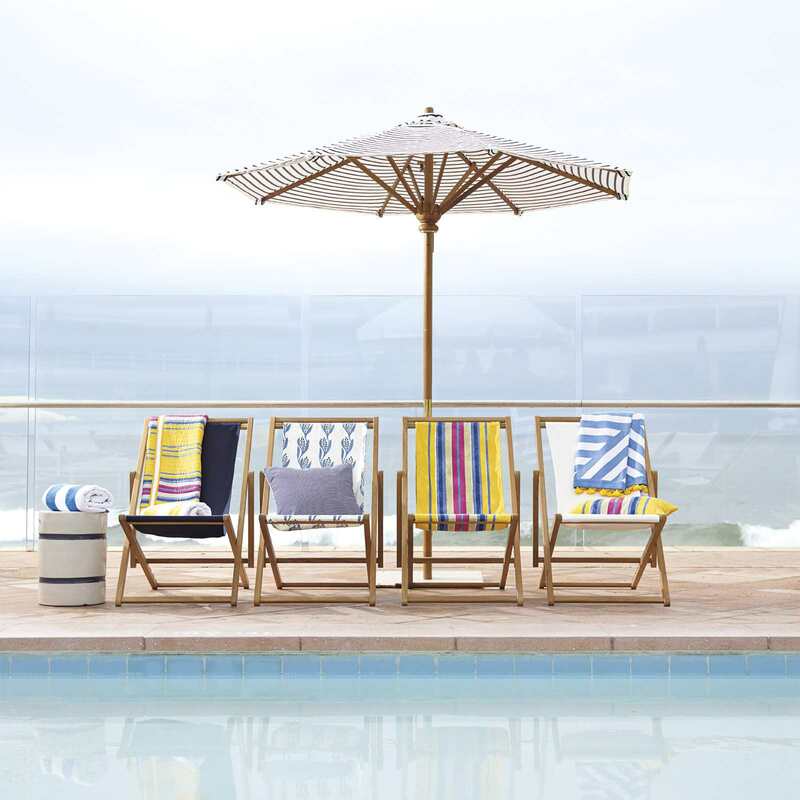 Why not bring a touch of the Riviera to your beachy home? These sun umbrellas remind us of those rows and rows of umbrellas you see in photos of the South of France and Positano. The best part? They come in a variety of colorful stripes including blue, red and green. Okay so a bicycle isn't technically a home accessory, but we couldn't resist including a beach house essential—the cruiser bike! This classic step-through from Pure Cycles starts at under $300, and is perfect for scooting to the shore and to and from the farmer's market.